The Cavalier King Charles Spaniel is graceful and elegant. They are most associated in history with those of nobility and aristocracy. They are a well-balanced toy Spaniel that display an affectionate and loving nature. They are gentle, but also have a sporting character, which enables them to do well in agility and hunting events. This breed loves to swim and is a natural retriever. The Cavalier King Charles Spaniel is best suited for a pampered indoor life. They display the temperament of an extrovert. They can be quite spirited and vocal. The Cavalier prefers to be with their family or other dogs. 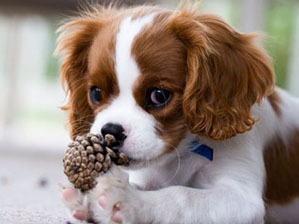 Although this breed is gentle and affectionate, they do not have patience for unruly children.The Cavalier King Charles Spaniel is highly intelligent and eager to learn. They can be trained in hunting and agility, and also do well in competitive obedience. The Cavalier makes an excellent therapy dog. They respond well to gentle training and high praise. The Cavalier King Charles Spaniel has a coat of silky hair that is medium to long in length. The coat is not curly but may have a slight wave. There is feathering in the tail, legs, feet, ears and chest. The Cavalier King Charles Spaniel can come in Black and Tan, Blenheim (Red and White), Tri Colour (Black, Tan and White), Ruby (Red).